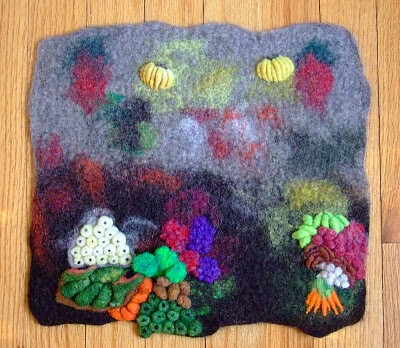 I took advantage of the perfect weather outdoors and wet felted the background for another dimensional landscape. I had some pictures from our visit last summer and am pretty happy with the felted background. This took a bit of work due to its larger size (~24" x 22"). I want to get as many backgrounds done while the weather is nice since I really don't have an area where I can wet felt indoors. I've been wanting to take a course in felting "pods" and didn't want to wait until the Fall, so I decided to experiment using a resist to create what I thought would be a pod form... Not bad for my first attempt - now I have to figure out what to put into the pod.. maybe a felted critter? 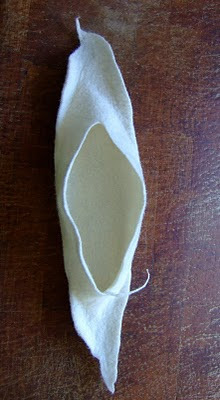 Back from a 2 day workshop by Andrea Graham, Felt Artist extraordinaire held at New England Felting Supply in Easthampton, MA - tons of fabulous felting supplies and only 1.5 hours away from Bolton. This will take a long time to add the fruits and vegies.. - soooo much fun! Laura & Andrea in front of some yummy fibers.. I'm happy to write that I've completed a needle felt wool rendering of our library in Bolton, MA. This library now has a massive addition which isn't part of this felted work since I started this piece 3 years ago.